The 250,000 member Long Island Federation of Labor, AFL-CIO, represents a wide range of union workers from teachers to technicians, public employees to painters, bus drivers to bricklayers, retail, auto, janitorial, utility, health care and construction workers. The Federation is the voice for the Long Island labor movement. It speaks on behalf of Long Island’s working families and its affiliated local unions to political leaders and legislative bodies at every level of government. The Long Island Federation of Labor supports the legislative and political programs of the National AFL-CIO and the New York State AFL-CIO. For over a decade, Vision Long Island has been honoring the individuals and organizations that display true Smart Growth leadership in advancing projects, policies, regulations and initiatives. Specific focus areas include mixed-use development, affordable housing, environmental health and safety, open space and historic preservation, traffic calming and pedestrian safety, transportation enhancements, clean energy, downtown revitalization and/or community-based planning. ONLINE REGISTRATION IS NOW AVAILABLE! Sponsorships and Journal Ad Space are available! Vision Long Island was in West Babylon this past weekend running a visioning process for the future of Van Bourgondien Park located on Albin Avenue. This community driven process is spearheaded by the efforts of Neighbors Supporting Neighbors Babylon, Inc., a Sandy recovery organization that is a part of Friends of Long Island. A steering committee built of 16 community organizations and governmental entities including Suffolk County Legislator Kevin McCaffrey and Town of Babylon Deputy Supervisor Tony Martinez have been meeting over the past two months to gather ideas and begin the planning process. No community park, however, should be undertaken without public input by stakeholders, including area residents of all ages and organizations that currently use the property or have an interest in using it in the future. The area, owned by Suffolk County and operated and maintained by the Town of Babylon, currently has a playground, concession stand, tennis courts, multiple soccer fields and a historic home on the property. Dozens of residents who attended on a day where the area had many other events running concurrently viewed presentations displaying examples of other park’s amenities that could be incorporated into the property, including playground options, trails, fountains, spray parks, concession stands, parking and fitness stations. Those in attendance, as well as the steering committee in previous meetings, were asked to “think big” when they were submitting ideas for the future use. Attendees then had an open session where they could discuss what their wants are for the area, as well as aspects that they would not like to see in the design proposal. Voting on the amenities followed which will allow the design teams to see what aspects of the revitalized park are most important to the residents, and what things should not be undertaken. The community broke into nine groups, each armed with a map and tasked to “design their park” with people that they were unaffiliated with in order to have a well rounded approach. Ideas included a new layout for parking for ease and safety, entrance and exit location changes to mitigate traffic congestion, a larger playground, repurposing the tennis courts for other activates such as bocce, shuffleboard, and deck hockey, a windmill, revitalizing the Veteran’s park and Eagle Scout project, walking trails, and a butterfly sanctuary with a tulip garden by the historic property. Many other ideas were suggested and will be taken into consideration as the community prioritized. The steering committee will meet again shortly to review the public input, and will continue to meet as the process moves forward. Those who would like to be notified about the next public meeting or who have questions about the project are encouraged to contact Neighbors Supporting Neighbors at (631) 885-1655 or by email. New parking meters in downtown Bay Shore will benefit the local economy.That’s the message from Islip Town Hall. Town officials are moving forward with plans to install 48 meters governing 1,450 parking spaces. "There were a lot of hard decisions with this. It wasn't a knee-jerk reaction," Councilman Tom Cochrane said. "This is going on four years of planning. We're trying to organize our assets and we have to manage them. We're trying to take this town to the next quarter century." Cochrane said the meters will improve customer turnover on Main Street and create revenue to repair the town-owned lots, add cameras around the LIRR station and improve lighting. Islip is facing an $11.3 million budget deficit, and that’s not including the anticipated multi-million price tag for cleaning up Roberto Clemente Park. The meters, approved in February 2014 with a $750,000 contract to Florida-based Cale America, are slated to be installed in stages. Meters for 500 parking spaces near the trains and 250 spaces on Maple Avenue will be first before meters for 700 spaces on Main Street and in the municipal lots north and south of Main. About 60 percent of the hamlet’s parking will remain free, town officials said. Parking meters have become a reality in other Long Island downtowns, like Port Jefferson, Huntington and Patchogue. And like many of those communities, Bay Shore motorists will be able to connect to the new meters wirelessly. Islip officials confirmed the new system will send text messages when time is almost up and can accept payments via smartphone. With paper receipts on dashboards a thing of the past, town employees would monitor patrons with their own hand-held devices. No decisions have been made about fines or fees for possible parking passes. And just like other Long Island downtowns where parking meters have taken hold, some opposition has emerged for the Bay Shore system. Attorney Andrew Siben collected more than 1,000 signatures on a petition submitted to Town Hall. Siben argued potential customers will opt for other communities or the South Shore Mall if they have to worry about paying the meter and tickets. Cochrane, however, dismissed the petition. Many of the signatures, he said, come from outside of the Bay Shore area. The project also has support from some on Main Street. Charles Beitch, owner of Suffolk Printing, had hopes parking meters would chase away merchants and employees from the prime on-street spaces. “The local customers that come in either for restaurants or my customers, they can’t find parking,” he said. "Kudos to the Islip Town Board for making the tough decision to back municipal parking meters in downtown Bay Shore. While initially unpopular the meters provide revenue for parking improvements, create circulation for retail to thrive and are structured to be updated with connections to your cell phone so you can add time without travelling back to your initial spot. Meters are an important tool in the toolbox for downtown parking and have been successful in the downtowns of Huntington, Port Jefferson and Patchogue," said Vision Director Eric Alexander. For more on this story, check out News 12 (subscription required) and CBS. How livable is your neighborhood? Several parts of Long Island were highlighted by AARP with their new Livability Index tool, unveiled Monday. The index scores communities on a scale from 0-100 based on factors like Smart Growth and walkability. “During a lifetime, people develop deep connections to their homes and communities. Our definition of livability considers the likelihood that everyone can continue to enjoy the vibrant communities they know and love as they age,” AARP said. The index evaluates cities, counties and states based on seven core categories: housing, neighborhood, transportation, environment, health, engagement and opportunity. Fed by sources like the U.S. Census Bureau, U.S. Department of Housing and Urban Development, and Centers for Disease Control and Prevention, these results are compared against national averages. For example, the Village of Northport earns an overall score of 52. High housing prices make the neighborhood less livable, but a strong opportunity score and solid marks in neighborhood, environment, health and engagement make the village appealing. All scoring begins at the neighborhood level – identifying more than 200,000 neighborhoods as defined by the Census, with larger municipalities receiving a cumulative score using the averages of the neighborhoods within. In general, New York City scored the strongest. Nassau County and western Suffolk County earned moderate scores, with weaker marks for the rest of Suffolk. However, Suffolk is one of AARP’s featured communities, as are the Towns of Brookhaven and North Hempstead and Village of Great Neck Plaza. The Village scored a robust 70, powered by strong neighborhood, transportation, environment and health marks. Both Brookhaven and North Hempstead scored identical marks of 58 with average and above average scores across the board. AARP officials said the project is useful for residents of all ages, although it’s designed to help Americans aged 50 and older be able to stay in their homes. “The index will help communities and people within those communities work to make their neighborhoods better,” Harrell said. “But what’s most important is, we need to make those changes now. We cannot wait to make the changes communities need,” Rodney Harrell, a housing expert at AARP’s Public Policy Institute, said. Check out AARP for their Livability Index and the Washington Post for more coverage of the program. On Tuesday, May 5, 2015 at 10:00 a.m. until 12:00 noon at theTheodore Roosevelt Executive and Legislative Building located at 1550 Franklin Avenue, Mineola, NY, the county will be holding a hearing to identify fair and affordable housing and community development needs in the County. The Nassau County Office of Housing and Community Development (OHCD) is the administering agency for the U.S. Department of Housing and Urban Development’s (HUD’s) Community Development Block Grant (CDBG) Program, the HOME Investment Partnerships (HOME) Program, and the Emergency Solutions Grants (ESG) Program, collectively known as HUD’s Consolidated Programs. These programs are intended to support the goals of providing decent housing and a suitable living environment and expanding economic opportunities primarily for low and moderate income persons. The Nassau County OHCD is in the process of preparing its Five-Year Consolidated Plan describing the County's housing and community development needs along with a Strategic Plan for addressing those needs during the upcoming five-year period (FFY2015-2019). As part of this process NC OHCD is collecting data and input from its participating municipal consortium members, local organizations, and the general public. As an identified representative of a local civic organization you are cordially invited to attend this meeting. Last weekend Huntington Station Happy Helpers, Friends of the HS Latin Quarter and Huntington Matters teamed up with over a hundred volunteers to clean up Huntington Stations streets and sidewalks. This Sunday at 10:00 Vision's Sustainability Director and Huntington Station resident Elissa Kyle is getting together more volunteers to clean the station sidewalks north of the train station. Volunteers can meet at the plaza at Olive Street at 10:00 to help spruce up New York Avenue from the train station to the community garden. Help us spruce up the Station! The 2015 Long Island Food Conference on Saturday, April 25, 2015 at Hofstra University will bring together hundreds of key stakeholders and members of our communities from across Long Island and the tri-state area to learn, discuss, and network about the importance of growing and promoting a sustainable local food system. 3) discussing ground-breaking policies and programs that help incorporate sustainable and locally grown food into our communities. The Long Island Food Coalition is the conference organizer and includes representatives from the following organizations: Hofstra University; North Shore Land Alliance; iEat Green, and; Long Island Group of the Sierra Club. The Long Island Food Coalition (formerly known as the Long Island Small Farm Initiative) sponsored the 2011 and 2012 Farm Summits at SUNY Old Westbury College and Hofstra University, respectively. These two conferences drew nearly 1,400 attendees and were very successful in bringing together a diversity of people dedicated to growing, promoting and consuming local food. We expect nearly 1,000 participants to attend the 2015 conference, including but not limited to educators, farmers, advocates, policy regulators, parents, students, concerned citizens and non-profit organizations. Learn more about sponsoring the conference, presenting a workshop, or volunteering. Vision Co-Chair Trudy Fitzsimmons Honored at "Strong, Smart and Savory 2015 Awards"
Girls Incorporated® of Long Island's mission is to inspire all girls to be strong, smart and bold. We provide school and community based programming that serves the unique needs of girls, ages 5-18, living in Nassau and Suffolk Counties. Through community partnerships, they help girls to achieve their full potential making their future brighter. Girls Incorporated® of Long Island is dedicated to the advocacy of gender equity for all girls in all areas of their lives. Through participation in their programs, girls learn the skills to become leaders in their communities, leading to exponential change. The Ethical Humanist Society of Long Island is honoring Journalist Robert Keeler, Legislator Michelle Schimel, & Activist David Sprintzen for their lifelong dedication to the betterment of humankind. Each has made significant contributions in the areas of justice, human rights, and humanitarian causes. Their work reflects the values that Ethical Humanists cherish, including the fervent desire for peace among nations, the recognition of the dignity and worth of each individual, and the obligation of each of us to work for societal change. Contact awardsdinner@ehsli.org or the Ethical Society office at 516-741-7304 for more information or to purchase tickets. Fresh off of last year’s events, Vision Long Island invites you to join us in local downtowns for the third Smart Growth Saturday! Visit real places with projects underway and well managed Main Streets, showing the progress of downtown renewal across Long Island. 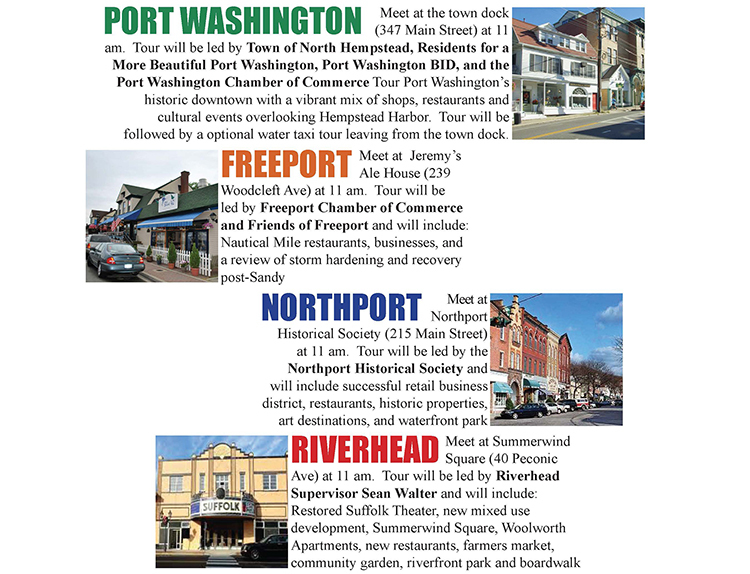 We have chosen these communities for this event and we recognize that there are many other downtowns across Long Island doing great work and we look forward to future tours. Join the ladies of the Long Island Hispanic Chamber of Commerce as they honor women making a difference on the island. Scheduled for May 15 at The Carltun in Eisenhower Park, the 10th annual Latina Hat Luncheon is an annual ceremony to commemorate exceptional business women, community advocates and inspirational role models. The event also provides an opportunity for networking and business exposure. Nassau County First Lady Linda Mangano will serve as mistress of ceremonies and PIX 11 News’ Lisa Mateo will provide the keynote speech. For more information or to attend, visit their website or call 516-333-0105. Tickets must be purchased no later than May 1st. New York State Assembly Member Phil Ramos and the Turkish Cultural Center of Long Island cordially invite you to participate in their Multicultural Business Expo which is designed to promote entrepreneurship, economic development, diversity, networking, sharing of business practices and innovation across all businesses and professional fields. This event founded by Dr. Suiv Lee and Prafulba Vaghela, should be of particular interest to businesses that have an interest in reaching Long Islands diverse ethnic markets. You have been selected to receive this special invitation because of your expertise and the important work your organization/Business has been engaged in. The Multicultural Business Expo will be held on Friday, May 15, 2015 from 6:00 pm - 11:00 pm at Upsky Long Island Hotel, 110 Vanderbilt Motor Parkway, Brentwood/Hauppauge, New York 11717.Representatives from the Business interest sections of Embassies of several countries will be present to provide information as to how they can facilitate the acquisition and importation of Ethnic products. Representatives of Suffolk Counties Foreign Trade zone, USAID and several other Government agencies will be at hand to create awareness of the services they offer to local and foreign businesses. There will be a cultural component to the Expo which will include ethnic performances and exposition of the work of local artist. We hope your organization/Business will consider joining us for the Multicultural Business Expo. We invite you to reserve a booth at the Multicultural Business Expo to highlight your organization’s outstanding contributions to the Long Island business community. We expect to have businesses and consumers from a variety of fields participate in the fair. For more information or to RSVP and reserve a booth, please contact Suiv Lee, at slee@adelphi.edu, 516.301.8476, Sadri Altinok, at altinok@optonline.net, 631.891.7511 and Prafulba Vaghela, at yacs2008@gmail.com, 516.708.3928. Thank you very much for your consideration of this request. On Friday, May 15, 2015, 8:00 AM – 10:30 AM , the APA Long Island Section will hold its annual Arthur Kunz Memorial Scholarship Breakfast at Molloy College’s Suffolk Center at Republic Airport in Farmingdale (see www.molloy.edu/about-molloy/suffolk-center). A healthy breakfast buffet will be provided. This year’s Breakfast will focus on water quality and wastewater management planning; a topic that is so critical to the economic and environmental resiliency of Long Island. The Long Island Section is pleased to offer an opportunity for Long Islanders to hear from experts from another region on how they are facing wastewater management challenges and providing solutions for improved water quality. We are very pleased to announce that Kristy Senatori and Erin Perry will be joining us from the Cape Cod Commission to discuss best practices for planners, engineers and policy makers who are responsible for and/or involved in water quality improvement initiatives. Water Quality Management: A Coastal New England Case Study will be moderated by Sarah Lansdale, Director of Planning, Suffolk County. Featured guest speakers include Kristy Senatori, Deputy Director, Cape Cod Commission Erin Perry, Special Projects Coordinator, Cape Cod Commission. Each year, the best and brightest of Long Island’s new and future professional planners compete for the Arthur Kunz Scholarship, which provides funds to its recipients for attendance at the annual American Planning Association National Conference. This year, the Arthur Kunz Memorial Scholarship has been awarded to three planners who were selected following a competitive process.honorees will be featured at the breakfast. To register for this event and pay online, please visit our website at www.apalongisland.org. Or, send a check payable to “LI Section” to: Kathryn Eiseman, APA LI Section Treasurer, c/o Nelson, Pope & Voorhis, 572 Walt Whitman Road, Melville, NY 11747. (If paying by check, please also send an email confirmation to Kathy Eiseman at keiseman@nelsonpopevoorhis.com). All net proceeds fund future scholarships!! The Greater Westbury Council for the Arts is pleased to announce an open call for artists and artisan vendors for “Westbury Art Mart.” This first annual arts market will be held Saturday, May 16, 2015 at the Piazza Ernesto Strada (at Post Avenue and Maple Avenue) in beautiful downtown Westbury from 10:00 am – 4:00 pm. This is an annual event which includes an arts market of local artists and artisans, live music and entertainment, gourmet food trucks, and more. This is an open call to all artists and artisans to exhibit and sell their work. Artists should apply using this form. For more information contact Maureen Baranov at maureen@westburyarts.org. The Long Island Coalition for the Homeless awards the Leonard I Saltzman Unsung Hero Award at its annual Keys for the Homeless Conference each year. Each year, two individuals are awarded this honor: One selected directly by the Keys Conference Planning Committee, and one from nominations made by the community at large. The purpose of the award is to recognize volunteers, direct care workers and/or other “boots on the ground” persons who go above and beyond to help homeless and at risk Long Islanders. Eligible applicants must be involved in volunteering or working with homeless and/or at risk persons in Nassau or Suffolk Counties. The Unsung Hero Award will be presented at the “Keys for the Homeless” conference to be held on November 13, 2015 at Touro Law Center, Central Islip. Recipients must be present to receive the award. Submissions must be e-mailed by June 5, 2015. For more information, please see the attached nomination form. The National Association of Realtors calls it placemaking, but creating parts of community that are safe, inviting and accessible is definitely Smart Growth. They consider Placemaking smaller, cheaper projects than traditional Smart Growth while still improving the community. The association is accepting applications for their Placemaking Initiative. Every year they bestow two grants valued between $500-$2,500 to support such projects. Applications are accepted throughout the year on a rolling basis and require a current photo of the proposed place. Visit their website or contact Holly Moskerintz for more information. The U.S. Department of Transportation announced today that $500 million will be made available for transportation projects across the country under a seventh round of the Transportation Investment Generating Economic Recovery (TIGER) competitive grant program. TIGER 2015 discretionary grants will fund capital investments in surface transportation infrastructure and will be awarded on a competitive basis to projects that will have a significant impact on the nation, a region, or metropolitan area. The grant program will focus on capital projects that generate economic development and improve access to reliable, safe and affordable transportation for disconnected both urban and rural, while emphasizing improved connection to employment, education, services and other opportunities, workforce development, or community revitalization. The Pre-Application deadline is 11:59 E.D.T. on May 4, 2015. For more information, visit http://www.dot.gov/tiger, which includes links to the Notice of Funding Availability, the 2015 Webinar Series, How to Apply, and more. WASHINGTON –Achieving education and career success is a goal that’s out of reach for too many of our nation’s youth. To make this goal more accessible to at-risk youth, the U.S. Department of Labor sponsors the YouthBuild program. YouthBuild helps young people who have left school early complete high school or General Educational Development programs, as well as learn critical job skills in construction, health care, information technology and other in-demand fields. Today, the department is announcing the availability of $76 million in funding to continue or expand YouthBuild programs across the country. Grants awarded through this funding opportunity will range from $700,000 to $1.1 million each to approximately 76 organizations to provide education and employment services to disadvantaged youth in their communities. The mission of YouthBuild aligns closely with the President Obama’s goals through the My Brother’s Keeper initiative, which seeks to address persistent opportunity gaps facing boys and young men of color and to ensure that all young people can reach their full potential. YouthBuild is a non-residential, community-based alternative education program that provides classroom instructionand occupational skills training in construction and other in-demand occupations to at-risk youth and young adults ages 16-24. Participants learn valuable skills as they build or rehabilitate housing for low-income or homeless individuals and families in their communities. Under the YouthBuild Construction Plus model, select programs may offer expanded occupational skills training in additional in-demand occupations. For additional information on grant eligibility and how to apply for funds, visit http://www.grants.gov. Intern with Vision Long Island! Vision Long Island is looking for interns! Our staff likes to say we "wear many hats," and interns will have to do the same. Interns will assist with planning, design, outreach, event planning, writing, research, attending meetings, reporting, photography, video and more. Bring your unique skill set to the table! We are looking for energetic and conscientious individuals with an interest in urban/suburban planning from a bottom-up perspective. This is a valuable opportunity to work with great people and learn about the issues impacting Long Island. Strong writing skills a plus. What's happening on your Main Street this weekend? Housed in a Civil War cottage, the museum chronicles Freeport's history through the 20th century. On display are a spinning wheel from the town’s oldest house, vaudeville-era items, waterfront memorabilia, a 1930s television and a 1777 13-star flag. The museum holds a collection of historic postcards and high school yearbooks from the early 1900s to present day. Founded in 1975, The Garden City Historical Society is dedicated to preserving the historic character and ambiance of the Village of Garden City, and educating its members and the public in preservation and history related matters. The Society owns and operates The Garden City Historical Society Museum at 109 Eleventh Street, an original 1872 A.T. Stewart-era “Apostle House” listed on the National Register of Historic Places, which was deeded to the Society by the Episcopal Diocese. The Society maintains an Archive of over 1,200 artifacts and a Historic Structure Survey of pre-1935 residential and non-residential structures in the Village of Garden City. It offers periodic lectures and presentations, and publishes a newsletter. The Society’s A. T. Stewart Exchange (consignment shop) on the lower level of the Museum offers unique items for sale. The shop (516-746-8900) is open from 10 a.m. to 4 p.m. Tuesdays through Fridays (Tuesday is senior citizen discount day) and from noon to 4 p.m. on Saturdays. For information, visit their website. The museum is a center for research on Long Island geology, Native American archeology and natural history. Current exhibits feature, “The Seasonal Round”, an exploration through Long Island Native American life throughout the seasons. Exhibits on Long Island’s glacial formation, landform change and cultural evolution are on display. Prehistoric artifacts and audio descriptions add to the story of Long Island migrants, their lifestyles and interactions with newcomers such as Europeans. The museum has special educational programs to accommodate field trips and science research on the history of Long Island. The museum features highly distinctive collections of antiques, artworks and fine furnishings from around the world. It is a premier art dealer dating back to 1971 and features expertise in 17th to 19th century works. The gallery experience offers the opportunity to not only view fine art but to purchase a piece which stands out. The museum includes a history of the Heitz Place Courthouse and a collection of earth science materials to describe the natural history of the area. It features one of the few remaining Long Island lock-ups and is one of the few remaining courthouses standing from before Nassau County split from Queens. The earth science exhibit in the museum has recent additions of a Mosasaur skull, prehistoric amber and the horn of a Triceratops horridus. The educational program at the museum offers experiences in paleontology, dynamic earth processes and investigating butterflies and moths. The museum, operated by the Long Beach Historical and Preservation Society, is a classic Craftsman-style summer villa. The house built in 1909, features large stain glass windows which are a hallmark of classic Long Beach estates. The house and backyard are furnished with local artifacts, including an original broadwalk bench, photographs and archaeological findings. The garden features original stock rose bushes. The Earle-Wightman House built in 1720, gives a picture of life in Oyster Bay during the colonial period and its transition through the mid-20th Century. It features an 18th century garden, maintained by the North Country Garden Club, holds ornamental plantings as well as herbs used for cooking, medical purposes and fragrances. Exhibited are postcard, photograph, map and newspaper collections. Current exhibition, “Women Wearing History: The Force Behind Fashion”, details women’s influence on the textile and fashion industry in the 19th and 20th centuries. The museum is a restored 19th century Victorian home which displays life in Rockville Centre in the 19th and 20th centuries. It features furnishings, antique kitchen tools, carpentry tools and clothing of the time period. The museum is considered one of the finest small museums in the state and there is never an entrance fee for special events or exhibits. The museum explores the relationship between Long Islanders and the sea through. It details the history of the regional whaling industry, whale conservation and the history of Cold Spring Harbor as a maritime port. A new exhibit, “Sea Ink” explores tattoo art and its nautical origins. Exhibits featuring New York’s only fully-equipped 19th century whaleboat, ship logs and correspondence as well as whaling and maritime artifacts. Art programs are available for all ages. The headquarters for the East Hampton Historical Society, the house is an example of life in the post-colonial era in the East End. It features historic furnishings and crafts built by local craftsmen of the time. The Historical Society also has four other museums and town houses including one of New York’s first educational academies and a colonial town government meeting house. The museum is the leading exhibition space for contemporary art on Long Island, featuring work from international, national and emerging local artists. It is said to be the best facility of its kind outside of Manhattan. Current exhibits feature “Print Up Ladies” which is a survey of contemporary works created by female artists, and “Inked” by Kathy Seff. The museum’s store features one of a kind jewelry, crafts and art work. Educational opportunists are also offered at the museum through its Cultural School of Arts. Before Selfies: Portraiture through the Ages, Poised Poses: Portraits from the August Heckscher Collection and Politics & War: Selections from the Permanent Collection of George Grosz. Tickets and more information available here. Assisted Living: The Musical How the Older Half Lives! My Mother's Italian, My Father's Jewish, I'm In Therapy! The Mather House Museum, the headquarters of The Historical Society of Greater Port Jefferson, and features several exhibitions of local artifacts. The museum complex features the 19th century home, a country store, a marine barn, a tool shed, the Spinney Clock Museum and the Thomas Jefferson Perennial Garden. Exhibitions feature ship models, period furniture and paintings, vintage tools and clothing, antique dolls, taped oral histories, 250 antique clocks and other examples of life in the 19th century. No shows scheduled this weekend. The museum details Sag Harbor’s whaling industry through the 19th century and its impact on the culture and development of the area. It details how the whaling industry brought migrants from all over the globe and turned the port into an international destination. Artifacts left by whalers, antique tools, harpoons, captains’ portraits, antique furnishings and children’s toys are all on display at the museum. The museum is the headquarters to the Sayville Historical Society. The museum aims to foster historical spirit, encourage historical research and to preserve historical materials. The museum features products of both Sayville and other Suffolk localities. The Society holds 4 historic buildings, 1,500 items of clothing, 1,000 photographs, a map collection and numerous classic furnishings. Its collection is ly growing and tours of the Edward Homestead offer a view at the areconstanta through its history. The Council aims to enrich the township and surrounding area’s quality of life through celebrating and supporting the arts in everyday life. It is a goal to make art accessible to people of all backgrounds. It Mills Pond House is a valuable place in its preserved traditions as well as its evolving and unique influences. Current exhibit, “Winners Showcase” displays the artistic development and achievements of the region and nation. Classes in jewelry making, poster design, scrapbooking, pottery, drawing and several other skills and topics are available. The Council has also partnered with local downtown businesses to display local artists’ work. The Southampton Historical Society was created to preserve the town’s history as well as history from the surrounding area. Its Rogers Mansion Museum features year round exhibits, a research center and education programs for children and adults. Current exhibit: Current exhibit: “If These Walls Could Talk: Meet the Families of the Rogers Mansion”. Its research center allows for visitors to conduct research with a professional research assistant. Collections feature antique furnishings, a classic parlor room and dining hall and photographs of the 1938 historic hurricane. Featuring 14 acres with 9 historic buildings on the West Sayville waterfront, the museum preserves Long Island’s maritime history and heritage. It is committed to research, preservation and interpretation of the region’s nautical history and the relationship to Long Island’s natural history. The Elward Smith Library houses racing trophies and records of over 500 wrecks and groundings in the Long Island waters. The other buildings feature rotating exhibits of maps, photos, newspapers and personal accounts of maritime history. Also highlighted are boats and materials left behind by the US Life Saving Service. Joined by board members, sponsors and friends, Vision announced the 2015 Smart Growth Award honorees at our annual Kickoff Event. Special thanks to National Grid for sponsoring the kickoff party. For Regional Leadership Randi Shubin Dresner from Island Harvest for all she does to help local communities and Will Stoner from AARP - a leader in walkable communities, livability and complete streets are honored. For Government Leadership Hempstead Mayor Wayne Hall Sr., for implementing a full scale revitalization plan for the Village. Community Leadership is represented by Jorge Martinez, Freeport Deputy Mayor, Past President of the LI Hispanic Chamber of Commerce and business owner working to rebuild his Village. Housing Choices is honored to Brooke Point a 39 unit affordable housing project in Valley Stream and the award goes to D&F Development and the Village of Valley Stream and Mayor Ed Fare. In this category we are also honoring Liberty Village - housing for homeless Veterans and associated services in North Amityville. Concern for Independent Living and the LI Coalition for the Homeless are the winners. The honor for Mixed Use goes to "The Loft" on Main a well designed mix of retail and apartments in Farmingdale. Honored are Staller Associates and the Village of Farmingdale with Mayor Ralph Eckstrand. Transportation Leadership is awarded to Jobs with Justice and the LI Bus Riders Union for bringing advocacy and victories for LI bus service. Walkability is ably represented by the Village of Great Neck's Incentive Zoning plan and Mayor Ralph Krietzman for promoting safe streets, apartments, town homes and a focused Main Street commercial district. The Planning award goes to the Port Jefferson 2030 Comprehensive Plan and Mayor Margot J Garant for a very thorough review and set of recommendations that navigate future growth. Lastly the Environment honor is for the upgrade of the Northport Sewage Treatment Plant given to Suffolk County specifically County Executive Steve Belllone and Legislator William R. Spencer and the Village of Northport servicing the downtown business district and cleanup of the Harbor. We strive to provide continued quality publications like this every week. If you have any news or events that you would like to add to our newsletter, submit them to info@visionlongisland.org for consideration. If you are interested in becoming a newsletter or news blast sponsor, please call the office at 631-261-0242 for rates and opportunities.